There is nothing like a vacation aboard your own private Charter Yacht! If you have not chartered before, you are about to discover one of the best-kept travel secrets in the world: Chartering your own yacht gives you the flexibility to do it all … or nothing at all! It’s affordable, it’s not complicated, you don’t have to know anything about boats – and, most important, it’s a whole lot of fun whether you want to spend the afternoon, the evening or the night on board. You’ll visit Grand Cayman’s best snorkeling and diving destinations each day with a degree of personal attention. Say good-bye to crowds, waiting in lines, and pre-set itineraries. This is your own private yacht, with a variety of amenities and water sports to enjoy at will, and the opportunity to go ashore whenever you please. We offer you beautiful, well maintained yachts. 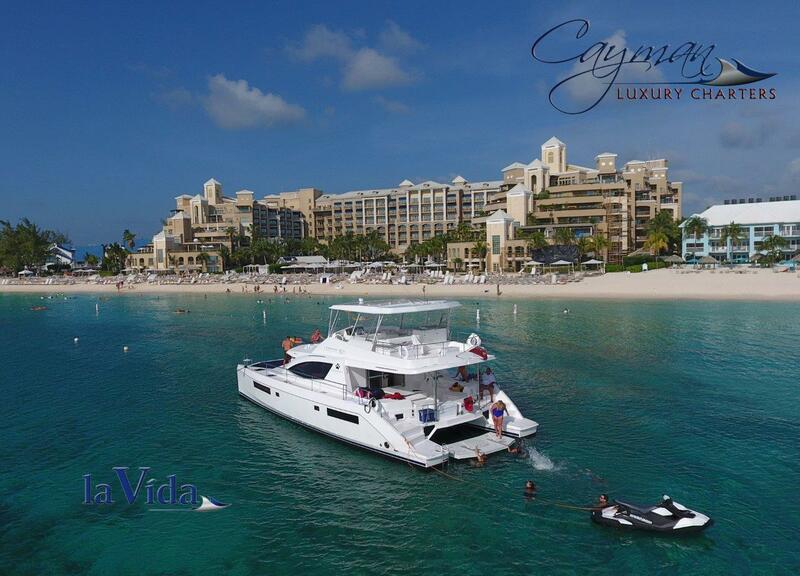 Our largest yacht is a brand new 51’ Leopard Power Catamaran named the La Vida that holds from 2 to 38 comfortably. Our larger yacht is a 42’ Sea Ray Sundancer named the Cayman Elusion that holds up to 14 comfortably. Our midsized yacht is a 40’ Sea Ray Sundancer named the Sea Star that carries 12 in comfort. Our smaller yacht is a 29′ Sea Ray Sport named the Cayman Evasion that holds up to 7 comfortably. We can accommodate large groups utilizing several yachts or medium size groups utilizing one or two yachts or small intimate groups utilizing the smaller yacht! The choice is yours as we give you more options to choose your desired charter. Your professional crew will take care of all the details, so you can relax and unwind. Your captain will personally guide you to your chosen destination, knowing where to find the most secluded beaches, the quietest anchorages or the liveliest activity. Our yacht offers a myriad of water sports. Snorkeling and fishing and on the three larger yachts, jet-skiing and tubing. These are just a few of the many activities you may find at your disposal, and your captain and crew will be well-versed in operating this equipment and can offer instruction on many levels. Activities are not limited to those found afloat, though. You will have ample opportunity to visit ashore to take part in shore side activities as well as visiting wonderful waterfront restaurants. We’ll customize your charter to your wishes!